Today, 500 Startups hosts their Demo Day for Batch 13 in Mountain View. 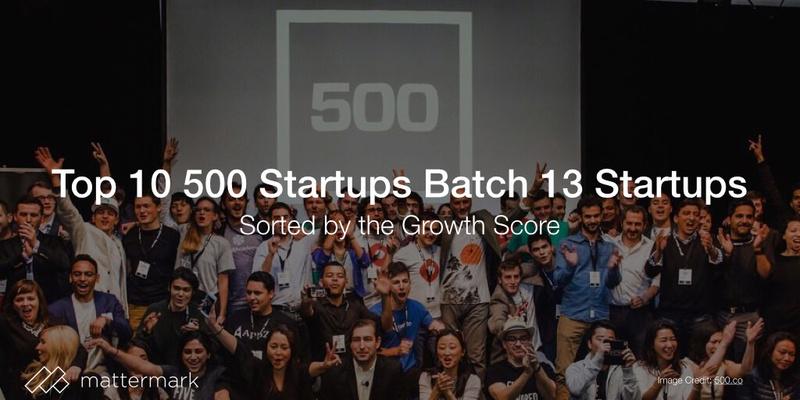 We ranked this batch of 500 Startups companies and found the following 10 with the highest Mattermark Growth Score. Glambot, is an online destination for the largest collection of rare, limited edition and discontinued items from coveted makeup brands. Mattermark Growth Score: 637. Storygami, is an interactive video SaaS tool that lets you easily add related content into your online videos. Mattermark Growth Score: 397. Pixc, helps eCommerce stores and individuals selling online increase their sales with better product images. Mattermark Growth Score: 361. Linguatrip, is a marketplace that connects language learners to language immersions abroad. Mattermark Growth Score: 321. Chattingcat, provides you instant corrections of written English. Native speakers correct English writing for grammar, word choice, style, etc. And you get corrections anytime and anywhere. Mattermark Growth Score: 266. Fishfishme, is an online platform to book fishing charter boats. It operates a marketplace, where customers looking to go on a fishing trip can browse charter boats in various countries and book trips. Mattermark Growth Score: 218. Omate, is a standalone wearable technology startup, which offers TrueSmart, a water-resistant smartwatch which works independently from and with all smartphones. Mattermark Growth Score: 217. Publishizer, is an an online crowdfunding platform specifically for authors. The site specializes in non-fiction. Mattermark Growth Score: 195. Kono App, is a Mobile Scheduler powered by Artificial Intelligence. Mattermark Growth Score: 166. ResultsOnAir, provides web analytics-level insights for direct response TV (DRTV) campaigns. Mattermark Growth Score: 149. To see more about the batch’s companies, sign up for a free trial of Mattermark Pro. How does 500 Startups compare to Y Combinator? What are the top industries of Batch 13?